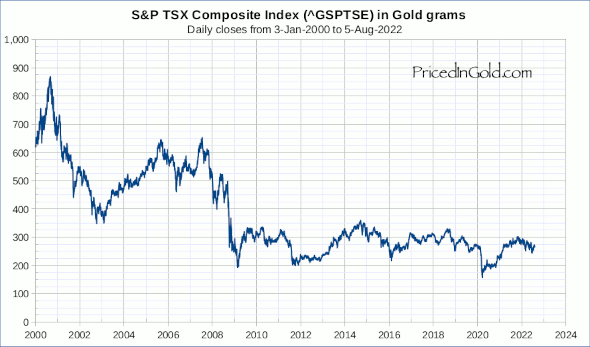 While the TSX has out performed the S&P 500, it has not held it's value in gold, aside from the period from 2003 through mid-2007. From 2000 through 2002, the TSX and S&P 500 performed similarly, with the TSX losing about 40% of it's value, while the S&P lost 47%. From the start of 2003 to the peak in July of 2007, the TSX rose 72%, reversing it's prior loss and posting a 4% gain. During the same period, the S&P lost 15%. From the peak in 2007 to the end of March 2012, the TSX and the S&P 500 are each down about 64%. Overall, the TSX has lost 63% since 2000, while the S&P has lost 83%.